The award-winning, Leatherman Super Tool 300 is the multi-tool for the working man. Larger pliers are the strongest we've ever produced and the sloped-top handle design means you can maneuver them further into tight spaces. When you're working with gloves on, the large side cutouts make it easy to still grab components and rolled handles make for a comfortable grip. Stranded, hard and regular wire cutters all come standard on Super Tool 300 and because they're removable you can repair or re-sharpen on the spot. 19 tools all ready for your toughest jobs. Super Tool 300 is back from vacation and ready to get to work. The Premium Leather Sheath is worn on your belt in horizontal or vertical orientation and has three pockets/slots for accessories. You can even store the tool with the pliers in open position. 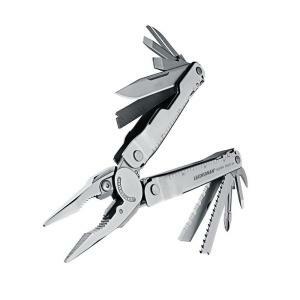 Tbook.com crawls the web to find the best prices and availability on Leatherman and related Tools and Hardware products like Leatherman Tool Group Super Tool 300 19-in-1 All-Purpose Multi-Tool. For this page, related items include products we find that match the following keywords: "Leatherman" at our vendor partner Home Depot. Leatherman Tool Group Super Tool 300 19-in-1 All-Purpose Multi-Tool is one of 14 Leatherman and related products listed in the Tools and Hardware section of Tbook.com If you have any questions on this product, please give us a call at 734-971-1210 during the hours of 9am - 5pm EST for assistance. Thank you for shopping at Tbook.com, the Internet Department Store!